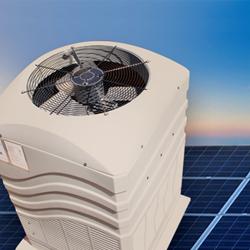 Starting in March, Villara Residential Solar customers in participating PG&E service areas will be able to request a free AquaChill energy-efficient air conditioner. PV installer, Villara Solar, has enrolled in a rebate program that allows residential PG&E customers to receive a free energy-efficient air conditioner. Under this incentive, recipients qualify for AquaChill's AQC48 model or its AQC60 system. Both of these units differ from conventional AC systems that use hot outside air to regulate indoor temperatures. AquaChill’s climate control technology leverages water to cool refrigerant coils, allowing it to run up to 15% cooler than air-powered alternatives. According to Villara, AquaChill can continue to deliver optimal performance – even when outdoor temperatures exceed 95°F. However, its AC units consume between 30% and 45% less overall power. California already has some of the highest electricity prices in the country, with rates expected to continue going up. And according to the state’s Energy Commission, roughly 44% of homeowners' electricity bills go towards heating, ventilation, and air-conditioning. By switching out older AC systems with more energy-efficient ones, homeowners benefit from measurable savings. Installing solar PV technology further boosts those savings since homeowners can power their AquaChill using free energy from the sun rather than relying on grid electricity. “They receive a free energy-efficient AC system that normally retails for $10,000. That system reduces monthly utility spending. And with solar helping to power the unit, homeowners can watch their utility bills go down even further." The financial benefits of energy-saving and energy-producing technologies will likely continue to attract consumer interest throughout California – a state that already has more installed solar capacity than all the other 49 states combined. However, further fueling the rise of rebate programs like this is California's growing commitment to environmental sustainability. Under its most recent renewable energy mandate, the state has pledged to generate 50% of its electricity from clean power sources by 2030. *Installation of the AC / AquaChill unit not included. Home must qualify. Cash back rebate available for those that do not qualify. Offer ends April 30, 2016. Launched in 2007, Villara Solar specializes in a range of renewable energy solutions, including residential solar, commercial solar, solar electric, solar thermal, and solar financing. From its headquarters in McClellan, CA, the company develops both residential and commercial solar projects throughout Northern and Central California.